Well the annual event that is the Warley National Model Railway show at the NEC has now been and gone and by all accounts it appears that it was a good year for the show. I certainly thought that this year there was a good selection of layouts, attendance was apparently up by 8% and most of the traders appeared to be doing good business. I certainly had a good weekend on the Hornby Magazine stand operating Mike Wild’s Hettle layout despite it being N gauge, Midland Region and DCC meaning my comfort zone was somewhere outside of Hall 5, but I think I pulled it off! As is becoming more usual now a number of suppliers and manufacturers time announcements, product development updates and availability of new product around the time of / during the show and this year was no exception. This post attempts to round up some of those items of interest from a Southern perspective. As per my post on Saturday, Kernow Model Centre have announced they are to commission via Dapol a Beattie Well Tank in 7mm along with suitable china clay wagons. Pre ordering and making a deposit payment of £100 will give you a saving of £100 off the £299 usual price. A ready to run 0 Gauge loco for £199 is a bargain I am sure many will not be able to resist. Full details can be found on my previous post here. I predict a number of new Cornish china clay shelf type inglenook shunting layouts popping up due to these models, which could also be easily changed to be a decade or so later by switching the Well Tank for a Dapol Class 08! They also had some of the livery samples of their Class 205 ‘Thumper’ DEMU on display, commissioned via Bachmann this certainly looks an excellent model. At the show an entire area was dedicated to the Lynton and Barnstaple Railway with the full size replica L&B locomotive Lyd being a centre piece surrounded by more L & B layouts than you could shake a stick at. 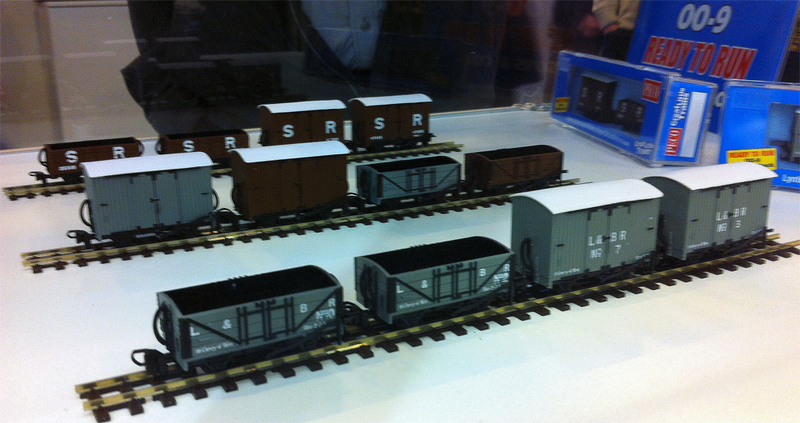 Peco took the opportunity to announce a new range of ready to run wagons and coaches in 009. Initial releases will be a box van and an open wagon in both L & B grey and SR brown available early in the new year with suitable coaches to follow later. More details and pictures can be found here Whilst I am sure these will be popular with existing 009 modellers the current lack of any suitable R-T-R locomotives in 009 might still deter new entrants to the genre (although fingers crossed that perhaps locomotives might follow). The long awaited C Class from Bachmann in both the exquisite full SECR livery and post 1937 Southern Liveries were available at the show and the BR black version is also imminent. I will be reviewing this model on this blog hopefully later in the week. In their usual display cases at the show were a number of Engineering prototypes of current work in progress and their version of the LMS main line diesel twins 10000 and 10001 looked impressive, mentioned on here as they of course ran on the Southern Region. 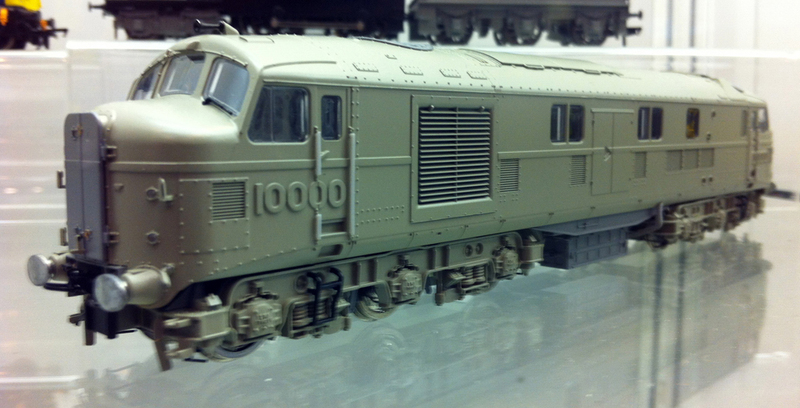 This model is in part commissioned by Rails of Sheffield with some livery versions being exclusive to them. Availability is anticipated to be early next year. Whilst the announcements made by Dapol at the show were for some modern image wagons in 0 Gauge (I assume to compliment their previously announced Class 08 shunter) they had for sale on the stand SR 5 and 8 plank open wagons also in 0 Gauge although I think these are generic open wagons rather based on specific SR prototypes. Dapol have also rereleased their N Gauge CCT (Van U) utility van which appears to have been slightly updated with finer tooling and NEM coupling pockets. Robert continues to add useful detailing items to his ever expanding range that can be found at www.rtmodels.co.uk. I covered his etched LSWR and LBSC lamp irons in my post here and can now confirm that the LBSC version is now available and has enough irons for two locomotives including the extended bufferbeam irons. On show for the first time at Warley were SR engine lamps very nicely cast in white metal offering a much finer scale alternative to those available from Spingside (although Robert’s do not have the jewelled lens). Also under his custodianship the Albert Goodall range now includes cast white metal brake cylinders for the Bulleid Pacific 4500 and 5500 gallon tenders that are noticeably absent from the Hornby models and are well designed to be a simple direct fit. The TMC commission, via Bachmann of the Mk1 Horsebox was available at the show and the weathered Southern Region green version I saw certainly looked extremely good. Further details can be found here.